Those who follow the fun and games created by the good people at Airbnb will be familiar with the “A Night At …” concept. Indeed, we’ve sorted out stays at such iconic locations as the set of Neighbours and a ski lift (along with some Rugby Players, for those visiting RWC 15). 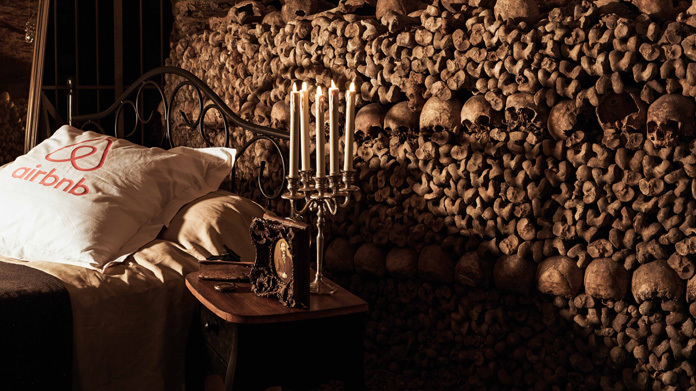 Well this time, Airbnb has teamed up with the Catacombs of Paris to offer the chance to spend Hallowe’en in the world’s largest grave, 65 feet under the city. Guests will be treated to a private tour of the labyrinth of bones and skulls, a culinary experience accompanied by the eerie sound of violins and a bedtime story of all the catacombs legends who have been laid to rest. The story generated spook-tacular (sorry!) coverage in The Sun and City AM, as well as the likes of the Daily Star, Daily Mirror, Metro, The Guardian and a host of others besides.